These pumpkin dinner rolls are the softest, fluffiest rolls that I’ve ever made. 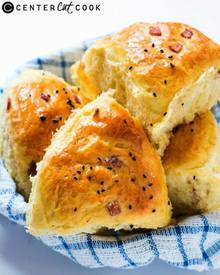 Combined with Bacon, these dinner rolls smell heavenly and are utterly irresistible. Infact I think everything pumpkin should be combined with Bacon. The slightly sweet, spicy pumpkin flavor is perfect with the smoky saltiness of Bacon.